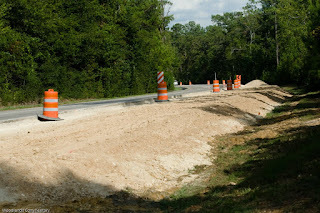 Finally, work has begun on the expansion of The Woodlands Parkway to six lanes from Kuykendahl to east Panther Creek. This activity is in the hands of two contractors. Hassell Construction will be constructing both sides of the portion from East Panther Creek to Gosling, and South Coast will construct both sides of the western segment from Gosling to Kuykendahl. Both segments of the road are being constructed simultaneously. That way, the overall project will end sooner and the inconveniences will be gone sooner. A separate project is defined to enhance the bridge over Lake Woodlands to make a continuous parkway of six regular lanes from I45 to Kuykendahl. The status of that project is currently unknown. However, it is speculated that it would probably cost $100+ million and the county cannot help us, so we would have to pass a bond to finance it. I have been told that the bridge is wide enough to be re-stripped for six lanes. We shall see how it works out. The current expansion project is scheduled to be completed in the first half of 2010. Depending on weather and circumstances, the work could go into the third quarter of 2010, or be completed ahead of mid year. 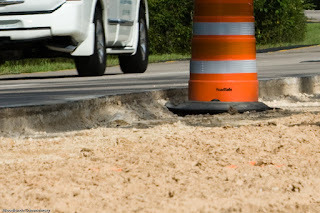 This is funded partially by The Woodlands Road Utility District (RUD) and partially by the county. As you can now observe, some trees have to be removed to clear the entire right-of-way needed to build the new lane on each side. The first phase is to prepare the right-to-way. Next, the roadbed infrastructure will be constructed. There is already evidence of that phase progressing rapidly on the western end near Kuykendahl, heading east. Then the third phase will be the pouring of concrete and the final phase will be the alterations by the county on the intersections. We can expect the concrete to be in place for a long time before we will be able to use it. There appears to be preparations already underway at some intersections for the work at the intersections, but I don;t believe that work will occur early in the project. The road bed material will be straight concrete. Apparently, there are no plans to lessen the surface noise with a different surface. That is disappointing. Residents don't have a lot to say in these projects. In fact, I don't think they get to say anything. We have association representatives and a township director assigned to the Chamber of Commerce meetings where mobility is discussed. There is little or no report outs. Resident representatives have told me they do not recall any meetings discussing these plans. The development company collects the money, makes the plans, lets the contracts and runs the projects. They have been kind enough to provide me with much of this information so that I could share it with you. The county partially funds most of our mobility projects. On this one, they have the intersections to configure, and they configure the traffic control system. There will be no safety shoulders on the parkway on the eastern side of Kuykendahl after this project is completed. It will be the same as the segment from I45 to the Lake Woodlands bridge. As the project progresses, there will be an attempt to keep four lanes open during rush hours, but the roads will only have one open lane while much of it is being constructed. So you might want to find an alternative for some commutes, especially after school starts. At some intersections, we will see additional turn lanes and and a change in pedestrian walkways. I am hopeful that there will be a change at West Panther Creek and at Gosling, to deploy the new smart crosswalk lights. This would enable a safer walk or bike ride and hopefully full use of the lights when pedestrians cross the parkway. It is evident that a better crosswalk is needed when you see elderly people in wheelchairs or little cars crossing when the lights are red, because they have to wait so long to cross. In fact, the wait can be so long now that almost anyone crossing the parkway has to do it by anticipating traffic and crossing while the pedestrian light is red. The intersection at Gosling is expected to have additional turn lanes and hopefully longer turn lanes to enable full use of the three lanes on either side of the parkway. Currently, one lane is often blocked by traffic waiting to turn left, especially when traveling west in the evening. I see a work crew today working at the intersection of Cooper, but am unsure if it is related to the project.